Any person at any given time is guaranteed to be experiencing some type of hardship: and that's just part of life. It's completely normal. What shouldn't be normal is the use of drugs in an attempt to fix these issues. Unfortunately, the use of drugs is often resorted to, especially among the uneducated. Maybe all your friends are doing them, or you feel like they're the only escape. 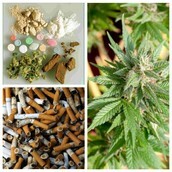 But when mistreated, drugs and other addictive substances have drastic effects on one's health: both physical and mental. Commonly used drugs come with multiple consequences. Many addle the brain and nervous system, and may seem enjoyabe in the moment. However, these drugs are also highly addictive, and overuse or misuse leads to health problems such as chronic dizziness, nausea, headaches, malnutrition from decrease or increase in appetite, increased risk of diseases, and many more. And these are only the physical outcomes. As mentioned before, drugs addle the brain's functioning, something that you never want to happen. Imagine the pilot of an airplane suddenly deciding not to work anymore. When your brain is constantly under attack by drugs, you can develop conditions such as a bipolar disorder, sleeping disorder (such as insomnia), depression, mood swings, anxiety, depression, and much more. Remember that you have something to live for. Keep that in mind the next time you think about doing drugs. What if you were put in rehab and taken away from your family because you couldn't stop snorting cocaine? What if your friends never wanted to talk to you anymore because you always stank of cigar smoke? What if you couldn't go to college or get a job because you were put in jail for smoking illegal marijuana. If you are considering drugs, you must also consider your consequences: any of these could be you. Drugs are never a permanent solution to any life issue. In the long run, they'll just worsen any problems that already existed. Getting help is easier than you may think. Try exercising or making a healthy change to your diet to get your brain working at its best. Plan a fun outing with people you enjoy, to have fun and remember that your life is worth it. If needed, speak to a therapist, counselor, or any trusted adult. They will always make time to make sure your life is well lived, because you matter.